Jiangxi Naipu mining machinery and New Materials Co., Ltd. develops, produces and sells rubber slurry pumps and rubber spares for mining equipment, which are widely used in mines, metallurgy, iron and steel and other industries. Our main products include mill rubber liner, rubber trommel screen, flotation rotor and stator, hydrocyclone, etc. The company was restructured from Jiangxi Naipu Industrial Co., Ltd. (founded in 2005) in April 2011, with a registered capital of 52.5 million yuan. 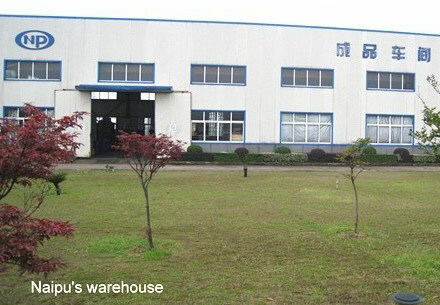 The company is located in Shangrao Economic Development Zone and now has a staff of over 270 people. At present, the company has passed the certifications of ISO9001:2000 Quality Management System, ISO14000:2008 Quality Management System and Occupational Health Safety Management System. In July 2007, the company won the certificates of High-tech Enterprise and High-tech Product issued by JiangXi Provincial Government, and hence became one of the Key High-tech Enterprises of JiangXi Province. In September 2011, the company passed the certification of High-Tech Enterprise and obtained the certificate of High-Tech Enterprise. The company has the most advanced 8000T, 3,800T, 1,800T, 800T platen vulcanizing presses and a 350T duplex vacuum vulcanizing presse and advanced vertical machining centers in China, as well as a whole set of inspection equipment produced by Taiwan Gotech Testing Machines . The company mainly produces mining equipment including NZJ series of slurry pumps and hydrocyclones with a specification of Φ660, Φ500 Φ350,Φ250, Φ150, etc., and rubber parts such as trommel screens, feed hoppers, pulp discharger assemblies, grates, trunnion liners, rubber shell liners, wear-resistant rubber wet end parts for slurry pumps, rubber liners for different grinding mills, stators and rotors for BS-K, KYF and XCF flotation machine stators and rotors, and other wear-resistant rubber parts. The 750NZJ, 450NZJ and other large-scale slurry pumps and wear-resistant rubber wet end parts are high-tech energy-saving products independently developed by the company, having filled up a domestic market void. All the products are produced with imported natural rubber. The mixed rubber made with the company’s special formula makes all its products have high wear resistance and corrosion resistance performance as well as a service life of 1.5 to 2 times that of metal ones. The company has a first-class fluid dynamics, mechanical design, rubber formulation and process R&D team as well as domestically leading R&D and innovation capabilities, product and mode design level and rubber technologies. In addition, the company has entered into close technical cooperation with East China University of Science and Technology and Jiangxi University of Science and Technology and employed a number of industry-renowned experts as technical advisers, who provide tremendous technical support for making slurry pump and mill rubber liner. Meanwhile, the company also boasts a high-quality, high-level and skilled worker team and mature operation standards. All products have stable and reliable performance. The company has established strategic partnerships with many large mining companies at home and abroad. The major customers of the company are Jiangxi Copper Corporation, China Metallurgical Group Corporation, Taiyuan Iron & Steel (Group) Co., Ltd., Pangang Group Company Ltd., China Nonferrous Metal Mining (Group) Co., Ltd., China National Gold Group Corporation, Tongling Nonferrous Metals Group Holding Co., Ltd., Jinchuan Group Co., Ltd., CITIC Heavy Industries Co., Ltd., Zijin Group, Aluminum Corporation of China Limited Zhongzhou Branch, Hebei Fengning Xinyuan Mining Industry Co., Ltd., Qinghai De’erni, Russia Sorsk Molybdenum Mine (SMR), Chile MEGAMIN, Mongolia Erdenet Mining, Zambia Chambishi Copper Mine and Australia Duratray. "Enterprise with Lasting Endurance, World Available Products" is the company’s goal. In a business policy of "High Quality, High Efficiency, High Technology, High Standard", the company is based on the local market with a professional and internationalized operation system and entering the world market!